As a photographer, you want to be able to focus on what you love: getting outside and shooting photos. You really don’t want to have to spend an inordinate amount of time building and maintaining a website just to be able to showcase your work. Enter SmugMug, my all-time favorite photography website for photographers (and I have seen my share). This well crafted, photographer-focused CMS allows you to create the best websites for sharing and dsplaying your photos. Do you have photos you want to display? Looking for a solution to protect and share your digital photos and build a stunning photo website for sharing your art? Maybe you want to turn your art into a business with a professional looking website where you can easily sell prints, book photoshoots, or share private galleries with family and friends without having to touch a line of code. Then SmugMug is probably your answer – it is the best website for photographers that I have found. You will love their out-of-the-box and easy-to-use design system, and can rest assured knowing that your photos are being stored in the safest cloud environment available within the industry. Every SmugMug site comes with a series of user-friendly and powerful marketing tools. All SmugMug sites are integrated with social media, shopping carts, and more than 1200+ printable products for their clients and fans to buy. Millions of photographers have made SmugMug the world’s leading independent photo sharing site since 2002. In fact, this website, Justin Katz Photography, is powered by SmugMug. Click here to get your free SmugMug 14-day trial today, and save 15% on a subscription. No Coupon needed! Amateur and beginner photographers who want to be able to display their work online. The simple interface and beautiful pre-made themes makes uploading your images into galleries a breeze. If you’re just getting started, then SmugMug is great. I also really like that they let you have the basic features low-cost subscription plan. It really has everything you need if all you want to do is be able to show your work in a fun and beautiful way. Wedding, commercial, and event photographers. the shareable galleries, easy display options, and ecommerce make SmugMug the best website for photographers. You can show beautiful interactive galleries to your clients when the project is complete. It also enables you to showcase examples of your work in a highly professional and clean way, increasing your hire rate for future gigs. Professional fine art photographers looking to sell their works online. The built-in search engine optimization (SEO) that Smugmug offers makes it so that your photos can be found by their key search terms. To do this well requires a bit more know-how and elbow grease, but the point is that the SmugMug CMS is a great website platform for professional photographers who are actively marketing their photography business online. I will explain in depth how to how to effectively optimize your SmugMug or other photo sharing website for search engines in another article, but rest assured SmugMug makes much of the process easy. They have multiple different subscription options depending on your needs, and all are surprisingly affordable. I would remiss if I did not mention my minor drawbacks to this otherwise fantastic product: there are some higher level, more complciated elements of website development that Smugmug takes care of, but that I personally wish I could have more control over. Mostly things like access to the HTML header, and things of that nature. These are not things that 99% of people using Smugmug would require, but this minor drawback is worth pointing out. In my quest to find the best website builder for photographers, I have tested out many different platforms, and have built out many different versions of my site/portfolio. In doing so, I have significantly improved my understanding of how to customize a website using code. I have learned things that I wouldn't have thought I was capable of, which has opened up new doors and options for how I would design and create my ideal portfolio. SmugMug is incredibly flexible, and the built-in features are amazing. However, if you are able to progress past a certain point, you will begin to notice the few (and very minor) limitations of the SmugMug system. Namely, that there is a limit to how much code you can customize. Again, this won't matter to the vasy majority of users, but it is a limitation that is worth pointing out. I wish I was able to insert custom email opt-in captures, custom social-share buttons, or advanced tracking analytics codes. These are things I can (and do) live without, but it is nonetheless a bit frustrating. Given how robust and stunningly beautiful SmugMug sites are, and the vasy flexibility that it offers, I would say that the positives definitely make up for these minor limiations. A great alternative to SmugMug would be Photoshelter. They also do an amazing job at allowing you to display your art in a beautiful and clean way, protect and promote your photos, and enable you to seel them online for profit. I will go give Photoshelter a more comprehensive review in another article. Additionally, Wix.com has a super easy, drag-and-drop website builder that is another great alternative to SmugMug. 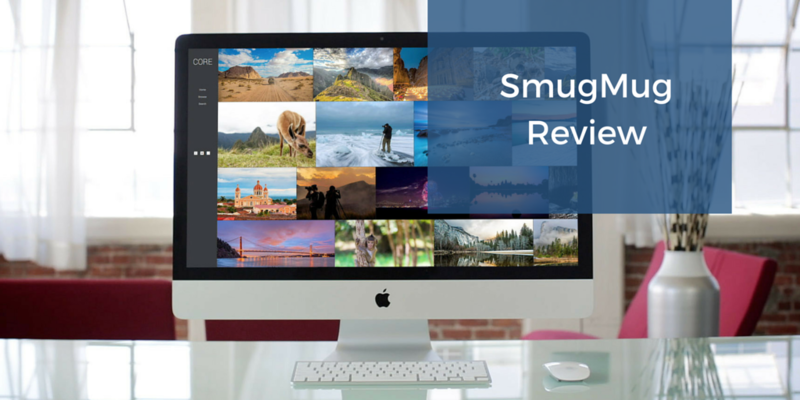 While I love the functionality and ease of use of Wix for creating a website for your business, for photographers specicially, I personally prefer SmugMug. You can check out the more in-depth review of Wix here. For more options, check out this side-by side comparison of the best websites for photographers that I have found. I wasted so much time with difficult free and paid photography websites and photo sharing websites, and I wish someone had just explained it to me like I am now: SmugMug allows you to create stunning photography websites with no experience needed, at little cost. There are some deeper level functionality items that I wish it offered, those limitations definitely do not hold me back from giving it a positive review. Even cooler, your photographs can actually start selling online to Strangers. Believe me, the first online sale you make is an incredibly gratifying feeling, as is every sale after that. The best part? You can get a free trial for 14 days to use the full functionality of SmugMug. Being able to use that trial, and seeing the robust and elegant display and usability of this photography hosting website, was what convinced me to get my SmugMug account, and I have loved it ever since. Looking for a SmugMug coupon you say? Click here to get your free SmugMug 14-day trial today, and save 15% on a subscription. Your coupon will be applied at checkout, or after your free trial. Create Stunning Photo Websites with SmugMug - Try it Free!